For upper elementary students, main idea is an important skill, but it can be difficult for some students to master. When students are able to determine the main idea of a text and identify details to support the main idea, it helps them remember important information and better understand what they are reading. Because of the difficulty that many students have with identifying main idea, much practice is needed throughout the school year. After initially teaching main idea and details early in the year, I try to give students many opportunities throughout the school year to practice and revisit this important skill. One simple and engaging activity to use is this easy main idea activity that incorporates a little "fun" into the lesson. 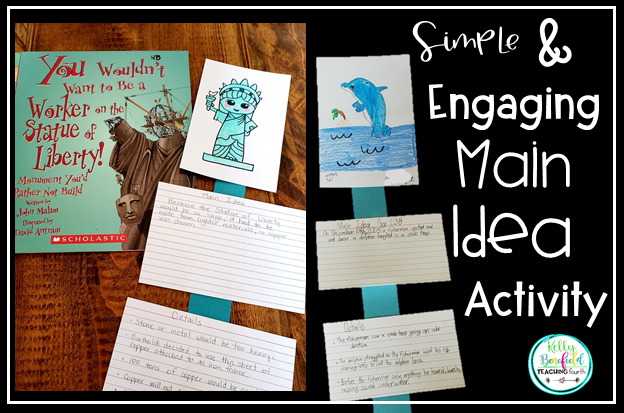 To peak students' interests and create an engaging lesson, I incorporated directed drawing, index cards, and writing into a fun, simple, and engaging main idea activity that your students will love! This fun activity is not designed or ideal for introducing main idea. Instead, this lesson is one that provides scaffolding and support for students as they review and practice main idea after it has been taught. For this lesson, I chose the high interest expository text Winter's Tail: How One Little Dolphin Learned to Swim Again. The students and I read and discussed this text together. As we read the book, I stopped at certain predetermined pages and modeled identifying the main idea and details. Slowly, I released the responsibility to the students and allowed them to turn and talk about the main idea of specific pages or paragraphs. I took large pieces of construction paper (12" x 18") and cut them into 1" x 18" strips. I gave each student one strip of paper. Each student then glued the dolphin index card to the top of the construction paper. Below that (leaving about a 1" space) each student glued the "Main Idea index" card. Then, skipping about 1" below that, each student glued the "Details" index card, and the "Summary" card was glued to the bottom. I know my students loved this because one student said, "We need to do this more often. This is fun!" Other great model texts to use with your students when finding main idea include: The Statue of Liberty by Mary Firestone and Matthew Skeens, You Wouldn't Want to Be a Worker on the Statue of Liberty by John Malam, Ice Cream by Gail Gibbons, Chicks & Chickens by Gail Gibbons, Great Migrations Whales by Laura Marsh, and Great Migration Butterflies by Laura Marsh. Any of these books would work very well with this lesson. Who doesn't love ice cream? This text is not only high interest, but it is also a great text if your students are struggling with main idea. Students love learning about the Statue of Liberty, especially with this high interest book. Students will also love drawing a fun little Statue of Liberty for their Main Idea display. Once complete, hang these in the hall or on a bulletin board. They are a great way to display the skills that your students have been learning. I hope you find something here that you and your students will enjoy. Have a blessed day!